Jeff Davey’s love for the game of softball was already well-established by the time he started playing 12-inch USSSA softball. A self-proclaimed softball junkie, Davey’s 16-inch career began with a team from Melrose Park, Illinois – The Lords – while at the same time he played 14-inch softball in Oak Park, Illinois. Driving from park to park to play up to three games in one night is both hilarious and a fond memory. While playing basketball at the La Grange YMCA another player asked Davey if he wanted to join a 12-inch softball team in Downers Grove that would become the heart of his playing experience. That team was the Bank of Westmont, and for the next 22 years Davey was part of the evolution of the team as it became one of the most consistently accomplished teams in the Midwest. “The Bank,” as it was affectionately known, went on to win numerous State, Regional and National Tournaments. Davey remembers fondly the 1984 A World Tournament in Anaheim, California. The Bank, a B team at the time, finished ninth out of 105 teams. Another memorable tournament occurred in Lafayette, Louisiana over Labor Day weekend in 1985 when the tournament was never finished due to a hurricane hitting the area. In 1993, Davey was fortunate to be a member of the Mid-America Concrete team that won the National Tournament in Lawton, Oklahoma. In 2002, his team, the Chicago Classics White, won the Senior Nationals in Phoenix, Arizona. Davey is most proud of the legacy that the Bank of Westmont created by respecting the sport and by playing the game the right way. The Bank respected all their opponents and each other during that 22-year run. Davey would like to thank his wife of 45 years, Pam, for all the latitude she gave him to play the sport that has meant so much over the years, including all the nights and weekends away to compete in tournaments. He is proud that Pam did such a great job raising their four daughters – Amanda, Kim, Laura and Carolyn. For fear of omitting somebody, Davey would never even begin to try to salute all the great players he played with over the years. Most of those players are already in the Illinois USSSA Hall of Fame. Two people do, however, merit special mention. Gary Stone (HOF 2016) was his traveling buddy for most of those 22 years. Davey cannot even begin to count the chewing tobacco stains on his uniform from Gary’s “spittin’ and chewin’” as they drove to another tournament with the windows down. The other person who deserves special mention is Marcel Lavesque (HOF 2003). Marcel is 93 now and was the best sponsor a team could ever hope to have cheering them on. He is a gentleman, but a helluva competitive individual. The honor of being inducted into the Illinois USSSA Hall of Fame means everything to Davey and is a meaningful recognition of a softball career and period of life that he holds very dear. He looks forward to styling his Hall of Fame ring as part of his daily wardrobe. Davey wishes to thank all his teammates, opponents, Brenda Paulson and the Hall of Fame committee for this very humbling honor. Well Cheezo, it’s been a long time coming, but welcome to the Illinois USSSA Hall of Fame! 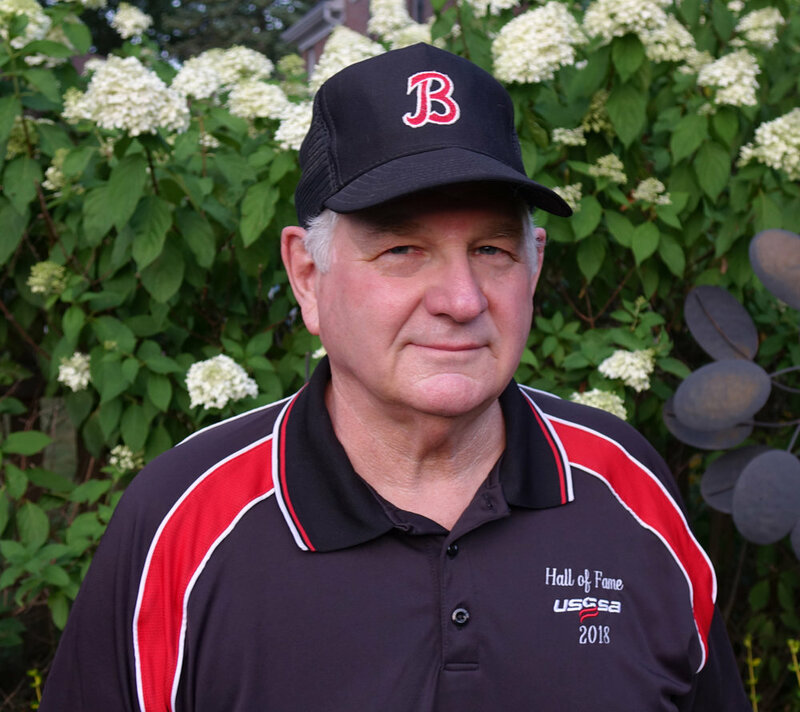 For the past 46 years, Mark Luttman has been turning double plays, driving in runs and making every team he plays for better. Luttman’s talent for the game of softball was evident early on when he joined his very first adult team at the tender age of 15. Growing up in a softball hot bed like Red Bud meant Luttman would have to prove himself to the veterans right away. Not only did he prove he belonged there, but the following year he was offered a roster spot with Horrell’s Distributing, one of the most dominant teams in the league. During his first year with the team, Luttman had a habit of wearing a straw hat in between games. That’s when the late Gary “Mo” Malott noticed Luttman’s resemblance to the beach life icon Panama Jack, giving him the nickname “Panama.” The name stuck. In the early 70s, Red Bud was a hot bed for softball, which meant some of the top teams in the country would come to the tiny Red Bud Jaycee Complex to compete for cash prizes. That meant Luttman got to compete against some of the best players in the country on a regular basis. He loved it. That’s also when he settled into his primary position, second base. With Horrell’s, he played in his first traveling tournament in Beloit, Wisconsin and from there the tournaments and teams started adding up. Over the years, Luttman has played in three B State Tournaments, three B World Tournaments, 6 C State Tournaments, 6 C Divisional Tournaments and 15 D Divisional Tournaments, winning several State Tournaments and finishing high in several more Divisional Tournaments. In addition to Horrell’s Distributing, Luttman played with many teams over the years including First State Bank of Red Bud in the 80s, Belleville Bud Light, Hi-Way Motors and The Mustangs in the 90s, Sportin’ Wood and Even Securities in the 2000s and Coors Light, .50 Caliber and, most recently, Peck Elite out of Springfield, Missouri. Luttman is still playing in the Senior Program and it just goes to show you his love for the game and his mantra, “you’re never too old to play” still holds true. Welcome, Panama, to the Illinois USSSA Hall of Fame and keep playing!